Introduction: Cochlear implant centers providing audiological and habilitation support to their implantees are also obligated to offer prompt and accessible equipment maintenance. Aim of the Study: To evaluate and compare the number of accessories requiring replacement by the different processors of the three major cochlear implant manufacturers: Advanced Bionics, Cochlear, and MED-EL. Type of Study: Retrospective. Materials and Methods: An analysis of the inventory of accessories required and used by 218 recipients supported by our center for a period of 3 years from 2010 to 2013 was done. These data were statistically analyzed for each manufacturer. Results: Eleven accessories provided by the manufacturer were replaced regularly by implantees over 3 years. Cables were the most frequently replaced accessory. Magnets were the least commonly replaced accessory. MED-EL implantees needed the maximum replacements as compared to implantees of the other two companies. Conclusion: Preimplant counseling regarding choice of any device usually includes technical details, esthetics, cost of the device, and expected outcomes. Maintenance of the device is often overlooked and becomes a major challenge for patients of lower socioeconomic strata of society. This study will enable clinics to give information regarding the sustainability of the device to the implantee, and the family which will definitely have an impact on better utilization of the device and better outcomes. Objective: To study the psychosocial consequences of severe deafness and the effects on the socioeconomic position of the affected individuals. 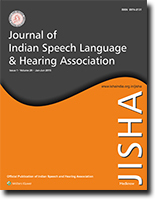 Methods: A cohort study of a deaf student attending a special education secondary school for the deaf and some of their teachers were randomly selected for the study. Sociodemographic characteristics, self-reported deafness, employment situation, and financial conditions, psychosocial consequences such as social isolation, denial of privileges, educational attainment, the level of achievement, and satisfaction with life were assessed using a semi-structured questionnaire. Results: All the participants had severe to profound hearing loss, and all of them could communicate by sign language. Adverse psychosocial consequences were found in this study population. A significant percentage was not satisfied with their current placement. A significant percentage reported limitation in their achievements and more than a third of them admitted to having been denied privileges as a result of being deaf. Social isolation was a major source of worry for 70% of the respondents and close to 40% admitted to being angry mainly because of the attitude of the society towards them. Underemployment was found in 44%, of the sampled population. Conclusion: Hearing impaired individuals are faced with economic and psychosocial adverse consequences. Labor market and educational policies must take into consideration these challenges to integrate this segment of our population into the active, productive sector of the economy.